Every ice angler has a go-to lure they swear will out-fish anything. Whether you’re ice-fishing for panfish, walleye, bass, or trout, you have plenty of great baits to choose from. But with so many jigs, spoons, soft-plastics, and lipless crankbaits out there, it’s no easy task deciding which lures will catch the most fish. In order to pick the best ice-fishing lures available, we consulted two of the top ice guys around. Hard-water experts Craig Oyler and Ross Robertson ran down their favorites. And with added input from other local sharpies, we narrowed down the list—in no particular order—to the 20 best ice-fishing lures. Better make some extra room in your tackle boxes. The Chubby Darter is an ice-fishing legend, and you won’t find a more effective vertical lure. Its slow sink rate and unique shape imparts a tantalizing swimming action that draws strikes. It has become a mainstay among ice anglers, and is equally effective for catching walleye, perch, bass, crappie, and pike. The Chubby Darter is available in 1 3/8- and 1 ¾-inch models in six detailed, lifelike patterns. The highly reflective finishes of the Leech Flutter Spoon flicker light to give the image of fish scales. Coupled with a distinctive flutter that tumbles back-and-forth on the drop, the lure is a master at triggering fish with its irritating and enticing flare. The Leech Flutter Spoon is made from a zinc alloy that is lighter than metals used in other spoons, and the lightweight design slows the sink rate, keeping the Leech Flutter Spoon in the striker zone longer. 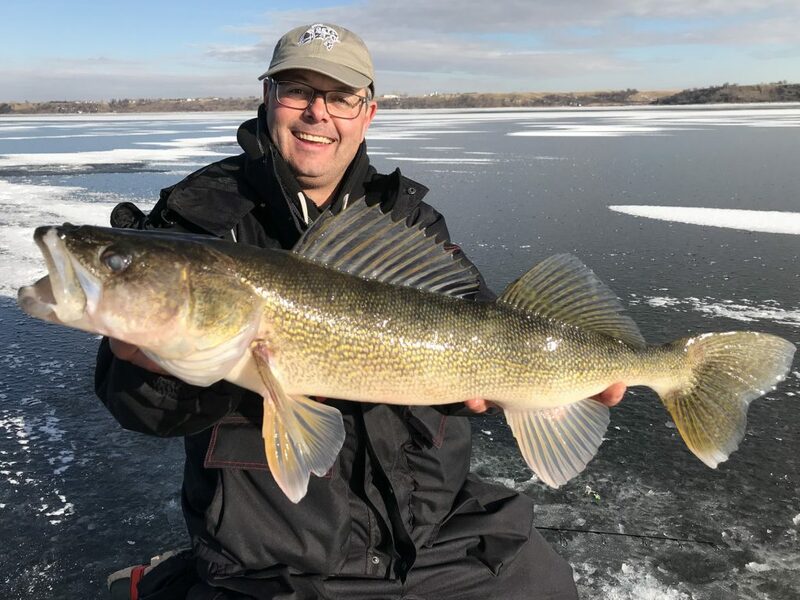 Buddy Jeff Matity sent me a photo the other day of his brother Jason with a gorgeous 29-inch walleye, that he caught last week while ice fishing on Last Mountain Lake, Saskatchewan. What made the catch even more remarkable, however, was the fact that the giant walleye was a male. With very few exceptions—northern range smallmouth bass being one of them—the advantage in the fish world almost always goes to the female members of the population, which grow much bigger in order to produce more eggs. That’s the reason why it is very rare, for example, to catch a male muskie that is bigger than 40-inches. But, what you might find even more fascinating is how Matity (who heads up Saskatchewan’s Fort Qu’Appelle Fish Hatchery) and other biologists distinguish male fish from female fish by simply looking at them. “I gave this tremendous character of a fish the name Donkey Kong,” says Matity, “because of its enormous head, slender body; large, thick, gnarly fins and grey-ghost appearance. I am familiar with what big male walleye look like from doing spawn camp on this system, and these qualities are tell-tale signs of a very old male. Indeed, we have several (although exceedingly rare) brood stock males in the 25- to 27-inch range that are still good spawners with good volumes of sperm and no discernible lack of quality. Matity went on to say that when he is handling captive rainbow, brown and brook trout of both sexes in the hatchery, as well as wild stocks of lake trout and walleye, he sees common physical characteristics developed by fish near the end of their lives. Matity also mentioned that when he and his team have collected lake trout spawn in northern Saskatchewan, they have taken fin ray samples of similar looking 6- to 8-pound trout. The male fish had the characteristic “thick fin” phenomenon and were aged at 26 years old. The same size females, on the other hand, were only nine years old. “These lake trout demonstrate what often happens with trout,” explains Matity. “The males seem to nearly ‘stunt’ at a smaller age, while the females grow considerably larger. That’s because increased body size means increased egg mass and volume for increased reproduction. Given all this, then, why did Jason Matity’s male walleye grow so big? “The literature suggests that a male walleye over 25-inches is virtually non-existent,” says Matity. “So why did Last Mountain Lake produce this guy approaching 30-inches? Superior genetics definitely played a role. But I believe food, and the way Mother Nature rationed it out, created “the perfect storm” for Donkey Kong. “The first five or six years of a walleye’s life are the most significant for skeletal body growth. This fish likely was the product of the resurgence of yellow perch and other forage fish around the time of the 2008 and 2011 floods on Last Mountain Lake. Those floods raised the water level, dropped the salinity, and kicked out record year-classes of many fish species. “Beyond age six, I believe this fish was able to seamlessly bridge the gap between eating perch and shiners, to eating juvenile and adult ciscoes, and continue what were virtually, back-to-back floods, and steam train-like growth spurts. Of final interest, and surprising to many, I am sure, Matity says that the vibrancy of these rare old male walleyes is still excellent, just as it with the giant female fish he often has the luxury of handling. 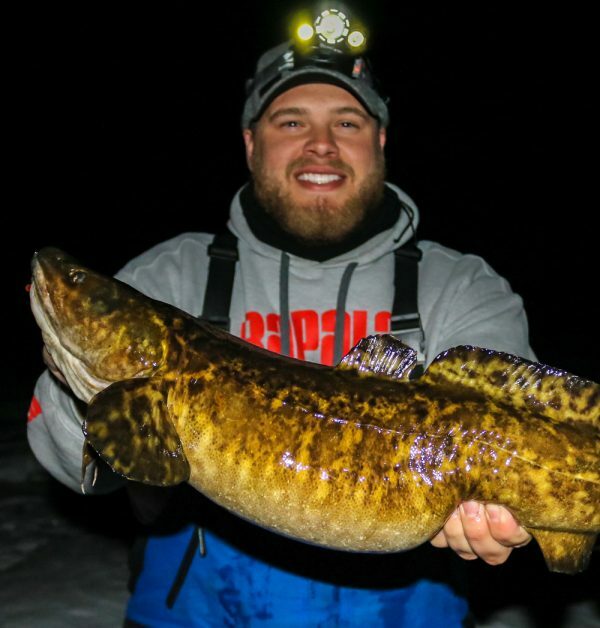 Ferocious, aggressive and awkwardly flexible, burbot are remarkable predators that have become one of my favorite species to target through the ice. The fight was what first got me hooked on this misunderstood water dragon — hook into just a schmedium-sized ‘pout and you’d swear you were pulling up a 27�”+ walleye. The combination of their hefty guts and the rockstar-esque head banging is sure to slap a smile on even the burliest of beards. With a single whisker under its chin — just like I had up until my mid-twenties — I can’t see myself connecting with any other species of fish on a more personal level. I mean look how they rock that big belly with pride! If I could share bunk beds with one, I would — swapping stories until we fell asleep, both dreaming of that next bacon cheeseburger…. Even our sleep schedules would line up as they’re the night owls of the fish community. Never eat right before going to bed? Burbot ignore the advice from all of those fancy nutrition magazines, regularly opting for the late-night snack run instead. While you can catch the occasional ‘pout during the day, the prime bite occurs after dark and well into the night. Note: The type of structure may be a little different for some of our Canadian neighbors waaaay up yonder, but how/what we catch ’em on is much the same. 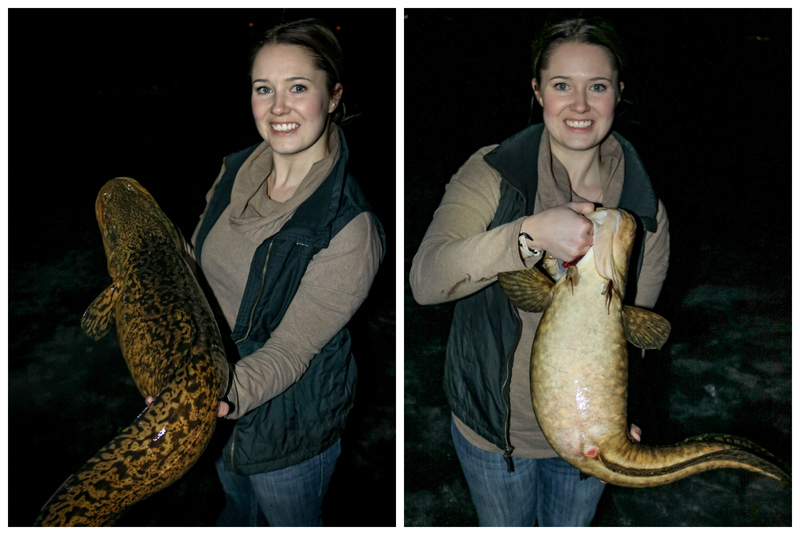 Hard, gravel-bottomed humps are king in late February and March when burbot spawn on bigger bodies of water. But don’t overlook deep weed edges at the bottom of steep breaklines — preferably off the edge of a large feeding flat. Burbot follow the food just like other predators. Some of the best bites I’ve ever been on have been a mile away from any rocks, and those belly draggers would even come up the hole with mud stuck to their guts to prove it. These fish are there because the area offers a great late-night menu, and burbot aren’t afraid to hit up the drive-through more than once. During daylight hours: Cruise the basin looking for water in the 40-60’ range near the deepest holes in the lake. These deep-water haunts may hold fish, but consider any fish caught during the daytime to be a bonus. The good news is that pinpointing these areas makes it easier to predict and follow their evening migration. As the evening progresses: Slide up towards the base of the dropoff where the basin meets the bottom of the break. These areas will look like classic walleye structure, which is why you hear of so many ‘eye guys complaining about accidentally catching burbs. This breakline bite is usually best for the 1-2 hours past sunset. After dark: Gradually work your way into shallower water until you’re fishing on top of the hump/flat that levels off in 10-20’. Focus on fishing the very edge of the top of the flat before it breaks off into deeper water. My go-to jigging spoon is called the Trout-N-Pout Spoon by Big Nasty Tackle, which are specifically designed for eelpout (yup, for real!). Years of banging them on the bottom and I still haven’t chipped the paint. They’ve got a super compact profile compared to their weight, which provides the perfect balance of bottom-pounding ability with the necessary flutter/wobble for enticing the picky biters. The majority of the time I prefer using the 5/8-oz size, but don’t be afraid to bump it up to 1-1/8 oz when fishing in deeper water…say 40ish feet or better. May sound ridiculously heavy, but that extra oomph allows you to pound the lake bottom to stir things up and call those nosy burbots in from a distance. The brighter the better when it comes to burbot, and the Trout-N-Pout Spoons have the brightest, longest-lasting glow that I’ve found. Green glow is a tough color to beat. Still, I’ll reel up and re-glow my bait about every 10-15 minutes. Local ‘pout expert Jason Rylander put it best: “I have been playing with larger profile baits and having real nice success. Again glow is key, but these fish are not afraid to go after a big offering”. These particular spoons also have built in rattles for added attraction. Tip ‘em with a matching pair of torn-in-half shiners or fatheads, and you’re in business — the business of burbot — which is an outstanding business to be in. Don’t be stingy on the minnows either. Pile ’em on and replace ’em often to make sure you’re getting as much scent into the water as possible. There’s nothing wrong with the stock hooks on these spoons, but sometimes I’ll play around with swapping ’em out for a dressed- or glow-treble hook. The VMC Glow Resin Trebles have got a glow-in-the-dark infused epoxy resin that screams, “Bite me!” when it’s swinging back and forth in the water. They’re sticky sharp and stout enough to handle an angry burb throwing around its weight. But it’s that extra glow shining from the middle of the shiner heads that I feel gets me a few extra bites over the guy next to me. Burbot primarily feed tight to bottom. Skip the “5-second rule,” they don’t mind picking their dinner right up off the lake floor. I like to pound bottom� several times to stir things up, then lift my spoon 6-12” off bottom and dance it in place for several seconds. This makes the glob of shiners do a tantalizing dance as they disperse scent and vibration into the water. Then I’ll do a larger lift of the rod tip at the end of the dance and let the bait crash back down into bottom before starting over. You won’t always graph ‘em, often times your rod will load up as you go to lift your presentation off bottom. Still, you need to make sure to keep a close eye on your flasher. Some of your bigger bites could come through as a large, active blob 3-6′ off bottom, and would pounce on a glob of shiners raised up and placed in front of their face. It used to be very common to see the random burbot lying slaughtered on the ice, frozen and wasted. 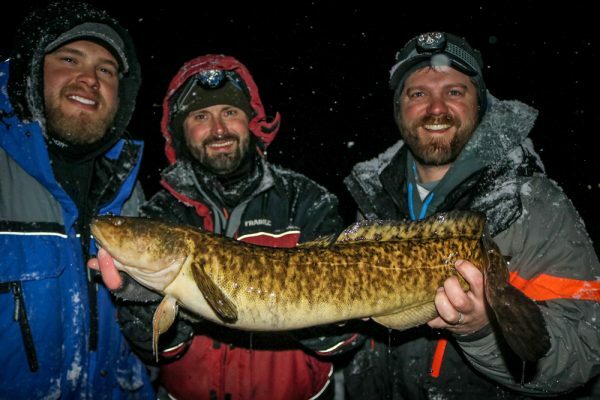 This is an illegal act, one of which is very ignorant and frowned upon with any species, and eelpout are no different. Never leave a man behind. They provide exceptional table fare! 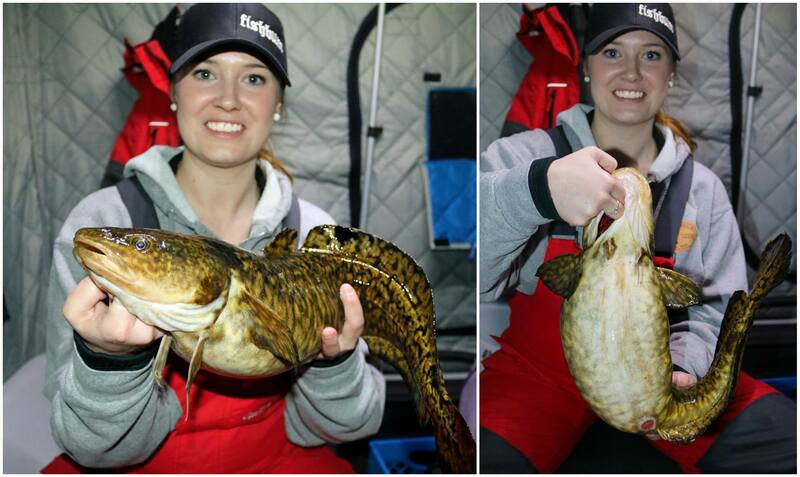 Boiled or deep fried, burbot are known as the “poor man’s lobster”� for a reason. If you’re not going to take the time to clean what you catch, let it go for another person to enjoy the epic battle that ‘pout offer. 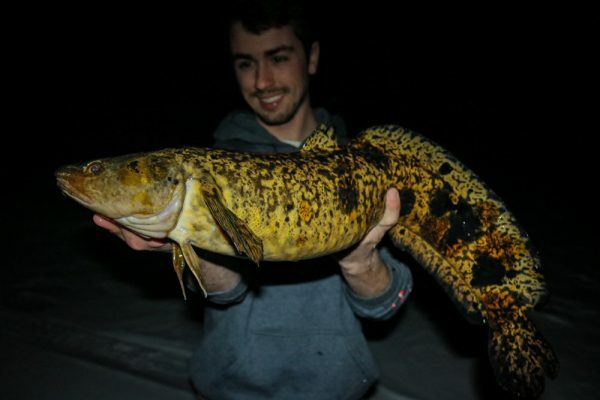 I realize there is no limit on burbot, but let’s practice selective harvest. Keep the smaller males if possible and let those big ladies swim. Approximately 20% of a big females weight is thanks to her eggs. That’s a lot of baby burbs! Respect the ‘pout. You’re sure to gain a newfound appreciation for these leopard-printed hand bags with shoulders after hooking up with one. Sit back, enjoy the ride, and hope your drag is set accordingly. Of paramount importance to any hobby is knowing what you're working with. Just like a golfer doesn't take a shot without knowing wind speed/direction, distance to the green, or pin location, you'll probably do a whole lot better at this ice-fishing thing if you know what species just showed up on your sonar. Each species has differing biology, behaviors, and ultimately, bite-triggers, making the game much easier to play when you're armed with species by species knowledge. While Fish ID is not a novel concept from the ice-electronics end of the world, the best any graph has mustered to-date is simply showing marks as small, medium, or large fish, often in varying degree or fashion depending on a number of factors. Underwater cameras are another way to get after fish speciation, but what if you don't own one, you're hole-hopping, or you're dealing with camera-shy fish? Enter Tony Roach, a man who has seen just about everything that swims on a host of ice-fishing electronics units. "That's a walleye," he confidently announced as we were jigging up bluegills recently. "See it belly-to-bottom, then come up, then drop down. It's done it about three times in the past 30 seconds." Eventually, Tony connects, bringing a particularly golden 'eye up on a panfish jig of all things. How did he know it was a walleye, when we had landed nothing but 'gills the prior 10 hours on ice? More importantly, what are the tell-tale signs, species by species, that will help us determine what we're fishing for, and ultimately what bait to present and how? Let's answer some of those questions. First and foremost, there's no substitute for seeing multiple varieties of fish in a host of depths, structure, and cover to help you accurately ID a sonar mark once you see it. These are generalities, made to help you start looking for cues to tip you off to fish species, such that you can present the right bait, the right way to them. That said, there's a few guides you can use to get started. If your sonar is worth a darn, big marks are big fish, small marks, often denoted by colors other than dark red, are small fish. If small fish look big, and big fish look the same size, it's time for a sonar upgrade. Use zoom mode if you can for the depth and application you're fishing to get the most resolution from your flasher possible. This is especially important for fish that hang on or near bottom like walleyes. Crappie targets are often a function of the depth you're fishing, and move slowly and methodically, usually in large schools suspended over deeper water. This is where an adjustable zoom mode, that increases target separation and precision anywhere in the water column, comes in especially handy. "Those things grow bigger and smaller on the Marcum as they mill around down there," Tony notes, "and they usually show up at the same level as the bait or just below if the screen was previously clear of fish." Usually, schools are segregated, so large marks will mean large crappies for most natural lakes. "Some days, bigger fish in the school feed above the rest, but more often you've got to punch down and past those smaller more aggressive crappies to get to larger fish. The best part, is that the marks don't lie. Big marks, are big fish," says Tony. Bluegills, to me, are probably the easiest, especially bull gills. They tend to emerge on your sonar near bottom, and will almost always slowly rise to your bait, stopping mere inches away to study it, making you guess the entire time whether or not they sucked in your offering, or are still staring it down. If you swing and miss, they're gone, rarely if ever to return. Even if they charge the bait and are extremely aggressive, they'll almost always still study the bait longer than most species will. Smaller versions of the species do look small on sonar, whereas bull gills can be mistaken for bass or larger predators if studying just the size of the mark alone. Either way, jigging too aggressively, especially as the fish closes can also get them to leave quickly. Speaking of bass, they typically show up at the same level as your lure, making the mark from your bait "grow" exponentially in size. Their attitude in winter is often ho-hum, so think bull gill mark, only larger. As a bass inhales the bait, the bite is slow, soft, and causes the rod tip to generally sink a good deal. Seconds in, you'll know what you're dealing with, and can adjust for additional fish that look and act the same way throughout the day. Pike show up where they please, and are often very large marks due to their length. Especially a large mark that appears well above your bait, anywhere in the water column, tends to be a pike in most Midwestern waters. This is doubly true when reactions are swift, with the target being large and red one second, and gone the next. In shallower water, say under 10 feet, they can come in so fast that you barely have time to see and/or react to any strike. Expect them to do the unexpected, and have your drag set! Walleyes are another easy one, often showing up connected to bottom and appearing as if it just got ever so slightly shallower. Roach, a particularly astute walleye angler mentions, "Eventually, that mark separates from bottom to come up to your jig, and either hits, or does not." The retreat and re-appear here are key to species identification here, as walleyes very typically do the "yo-yo", up and down trick a few times before committing and hitting unless they're very aggressive. Dropping the bait into bottom, playing keep-away, and generally being a bit more aggressive with your jigging stroke can be effective ways to catch them once you know what you're dealing with. Use these clues and continually question what you're seeing. Make note of even the slightest observations, compare with an underwater camera if available, and convert those fish behaviors onscreen into actionable intelligence that you can use to entice more of their kind to the top of the ice. In last year's Ice Fishing Guide, In-Fisherman Editor In Chief Doug Stange picked his Top 10 Ice Lures of All Time. He focused on lures for larger predatory fish: walleyes, pike, bass, lake trout. His choices were (in no particular order of preference) the Acme Kastmaster, Custom Jigs & Spins Slender Spoon, Jig-A-Whopper Rocker Minnow, Northland Forage Minnow, PK Flutter Fish & PK Spoon, Nils USA Hali, Williams Nipigon, Rapala Jigging Rap, Nils Master Jigging Shad, and Livetarget Golden Shiner. That's actually 11 top choices, but he included the two PK items together as one. We asked three noteworthy members of the ice community to make their choices. Cory Schmidt has been writing about ice fishing for decades and is a longtime In-Fisherman field editor. Tom Gruenwald also is a longtime writer on ice topics and a TV host, who has for many years worked in various capacities with HT Enterprises, a well-known ice-industry company. Jason Mitchell also is a well-known writer and TV host, who has been instrumental in designing ice equipment. Their picks are offered in no particular order. Sebile Vibrato—I love the horizontal posture and vibration. It's an overlooked option in most ice locales. Rapala Jigging Rap—The #7 and #9 are big-fish hero lures. Bay de Noc Lures Do-Jigger—My favorite flutter-style spoon of all time gives off subtle, baitfish-like flashes on the upstroke and has a beautiful shimmy on the fall. Salmo Chubby Darter—In-Fisherman Digital Editor Jeff Simpson's creation is the best predator "fish call" ever made. Custom Jigs & Spins Slender Spoon—Another exceptional light flutterspoon. Northland Tackle Macho Minnow—Catches pressured fish like few other spoons. Reel Bait Flasher Jig—I love this jig in dark water, tipped with a lively fathead or shiner, worked within a foot of the bottom. Works deadsticked on or near bottom, as well. PK Lures Flutter Fish—Every time I fish this spoon, I wonder why I don't fish it more. Always catches fish. Jig-A-Whopper Lazer Rocker Minnow—First offered by Gary Snyder's Jig-A-Whopper brand, HT Enterprises now markets this aggressive-working spoon—another all-time great. Lucky John Maiko—After one season, I think this one could become another classic. It's a swimming minnow with a wobbling action you have to see to believe. A great fish caller, and they eat the heck out of it when they get there. Schmidt: "There's something satisfying about still being able to tie on the same magical silver-blue Do-Jigger I used 25 years ago to catch walleyes. And even after all this time, walleyes in most icy environs still also react aggressively to a #7 Jigging Rap. Indeed, last winter, I broke out an old orange-and-gold foil pattern Jigging Rap I purchased from Dave Cook's Sporting Goods in Denver, Colorado, around 1979, and caught my biggest walleye of the season. "My wish for new entries in the swimming lure category were granted this year. As I held Berkley's Snap Jig in my hand, even in the heat of Orlando's July 2017 ICAST show, my mind immediately pined for first ice. It has a tail resembling the Jigging Rap, giving it a wide gliding action. It also has a barbed keeper for rigging with your favorite softbait. Small flukes come to mind. Z-Man's Slim SwimZ has been a recent favorite. The new Berkley PowerBait MaxScent Flat Nose Minnow is another good option. This, along with some of the new walleye-sized tungsten jigs, such as Fiskas XL Walleye Jig, give anglers hope that good things are happening on the ice lure scene. And yet, we know our favorite old Do-Jiggers, Swedish Pimples, Rocker Minnows, and Kastmasters can just as easily emerge from the box when a fish needs catching." Acme Little Cleo—The erratic action generated by this little dynamo makes it versatile, a powerful flurry of attraction and strike production. Jig-A-Whopper Lazer Rocker Minnow—This original Jig-A-Whopper design, especially when tipped with an action softbait, has been remarkably consistent for tempting fish. Bait Rigs Willow Spoon—With a hop and a fall on slack line, this one flips broadside and flutters, a terrific option when fishing shallow, over thick cover, or attempting to trigger tentative fish. Snyder Lures Big Shaker—Whether aggressively ripped or gently quivered, this double-bladed, dimpled gadget with secondary fins creates a loose, fluttering mass of flash and vibration. Rapala Jigging Rap—Perhaps the single best ice fishing lure of all time—a classic. Jig-A-Whopper Hawger Rattle Spoon—Especially good in stained water and low-light conditions. The slightest wiggle generates strike-­agitating commotion. PK Lures Flutter Fish—Flashing, flickering, rocking, it's a winner that emulates dying baitfish to perfection. Bill Lewis Rattle Trap—Not considered an ice fishing lure by most, this noisy, high-profile crank works wonders at times. Len Thompson Five O' ­Diamonds—Somehow, even when nothing else seems to be doing well, this little gem produces action. Rapala Jigging Rap—It's hard to disagree with so many who observe that this might be the best ice lure of all time. The Northland Puppet Minnow also deserves mention among this class of lures. Clam Leech Flutter Spoon—My go-to spoon the last year, especially for walleyes, but it's also a fireball for trout, perch, and crappies. Acme Kastmaster—An angler could tie one on a rod and never take it off the season long. Northland Tackle Buck-Shot Rattle Spoon—The same with this classic fish-producer. 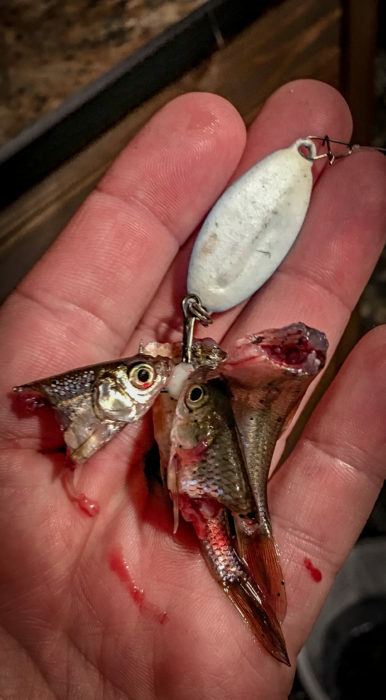 Clam Rattlin' Blade Spoon—Tinkle-tinkle, flash and dash, attracts fish and gets them to bite big time, especially active fish. Sports the loudest rattle that barely requires any movement. Salmo Chubby Darter—This silent wobbler rides beautifully on a horizontal plane. It's my choice in so many situation for big walleyes, pike, and lake trout. Livetarget Golden Shiner—The one that started it all, or at least revitalized the use of lipless lures for big walleyes and lake trout. Salmo Zipper—Another sweet lipless option. It was the smallest size (#5) that helped bring the lipless craze back into focus for me. Bay de Noc Swedish Pimple—Perhaps the best spoon design of all time, having stood the test of time for more than 50 years. Clam Blade Spoon—Gets the call when I'm looking for a silent spoon that fishes subtly. Produces a deadly treble-hook bounce on a tight quiver. Page created in 5.392 seconds with 34 queries.